Children from the poorest homes are almost a year behind middle class pupils by the time they start school, research suggests. But good parenting, such as reading to children and having fixed bed times, can significantly reduce this gap, the study for the Sutton Trust says. 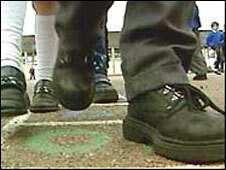 The educational charity urged the government to fund parenting classes, especially in deprived areas. The government said the gap was closing fast but that there was more to do. The Sutton Trust study looked at the results of a series of vocabulary tests carried out by 12,500 British children at the age of five. It found those from the poorest homes were nearly a year behind in their results. It also looked at the factors common to poorer children that might influence their development. It found that just under half of those from the poorest fifth of families were born to younger mothers under 25. And just under two-thirds did not live with both biological parents, it said. It also isolated some factors that boosted children's development on both the poorest and the richest homes. These included "sensitive parental behaviour", such as ensuring regular bedtimes and reading daily to the child. Regular bed times between the ages of three and five led to development gains of two-and-a-half months, researchers said. Daily reading at the age of three boosted vocabulary development by nearly two months. And children whose parents arranged monthly library visits were two-and-a-half months ahead of an equivalent child at the age of five who had not made similar trips. According to the study, better parenting could reduce the achievement gap between middle-income and poor families by up to nine months. However, just under half of children from the poorest homes were read to every day at the age of three, compared to 78% of children from the richest fifth of home. The authors noted that the UK had invested 4.3% of GDP on early years education in 2006. But they called for a more effective early years strategy that would prevent greater numbers of children from disadvantaged backgrounds "falling behind their more fortunate peers before school has even begun". Sutton Trust chairman Sir Peter Lampl said the findings were both shocking and encouraging - revealing the stark educational disadvantage experienced by children from poorer homes before they reached school. But it also showed the potential for good parenting to overcome some of the negative impacts that poverty could have on children's early development, he said. Study author Professor Jane Waldfogel, visiting professor at London School of Economics, said: "We now have sound evidence about policies and programmes that raise achievement for low-income children and help reduce gaps in early childhood. "We also know that the best of these investments will yield returns well in excess of their costs." The report also called for more support for families from health professionals and early learning experts and special outreach projects to improve contact with vulnerable families. Expansion of free nursery education should be focused on the 15% most disadvantaged families, it added. Children's Minister Delyth Morgan said the government's rules on what is covered in childcare settings were ensuring that toddlers were learning through play and getting proper stimulation. "The childcare entitlement means even low-income families can benefit from high quality childcare that prepares toddlers for school. "But let's be clear, whilst there is much more to do, the gap between rich and poor in early years is closing, with the lowest-achieving children not only keeping pace but improving faster than the rest. "We will continue to focus extra resources on the most disadvantaged children," she added. Chris Keates, general secretary of the Nasuwt teaching union, said: "An essential component of all early years' provision, public or private, is the employment of qualified teachers as part of the team around the child."